Diameter 3 to 4 inch. Works on the cohesive force. Tough High Density Polyethylene Housing. The filter efficiency remains unchanged even with the variation of rainfall intensity. 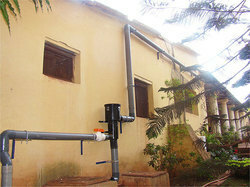 Rainyfilter used in roof top rain water harvesting. Its work on centrifugal and cohesive force. Debris, leave and dirt particles are removed continuously and flushed out. Compact design for simple installation. Fully enclosed and wall mounting. Tough high density polyethylene housing. No consumables required. No required. Special Features of RAINYWorks on the cohesive force.No power is required.Self cleaning.Debris (leaves etc) and Dirt particles are removed continuously and flushed out.Compact design for simple installation.Fully enclosed and wall mounting. It can be fitted even in ducts.Tough High Density Polyethylene Housing.Filter Pipe connections can be turned 360 Degrees.No consumables required.The filter efficiency remains unchanged even with the variation of rainfall intensity. Rainy¿¿ filter used in roof top rain water harvesting. Its work on centrifugal and cohesive force. Debris, leave and dirt particles are removed continuously and flushed out. Compact design for simple installation. Fully enclosed and wall mounting. Tough high density polyethylene housing. No consumables required. No required. Cleaning rainy water for borwell¿¿used in roof top rain water harvesting. Its work on centrifugal and cohesive force. Debris, leave and dirt particles are removed continuously and flushed out. Compact design for simple installation. Fully enclosed and wall mounting. Tough high density polyethylene housing. No consumables required. No required. Rainy filter used in roof top rain water harvesting. Its work on centrifugal and cohesive force. Debris, leave and dirt particles are removed continuously and flushed out. Compact design for simple installation. Fully enclosed and wall mounting. Tough high density polyethylene housing. No consumables required. No required.